While spiral stairs are popular in modern homes, they've been around for quite a while! Throughout school, everyone learned about ancient architecture and our ancestor’s ability to build iconic structures such as The Coliseum and the Pyramids. These buildings still stand as representations of the superb engineering capabilities of past civilizations. 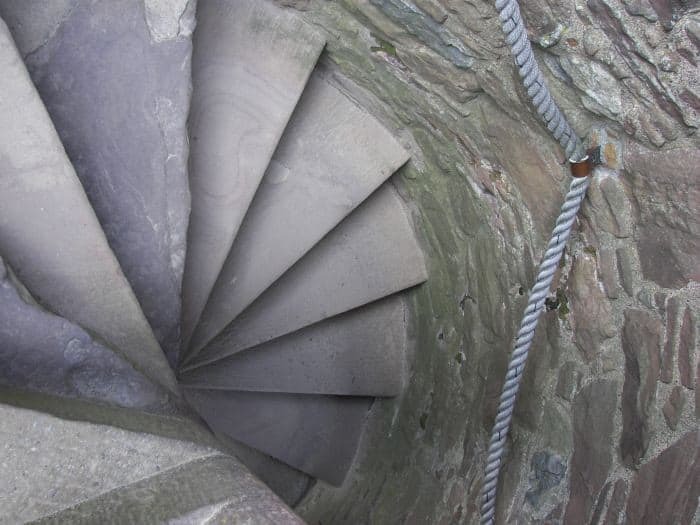 In doing research for my next blog entry, I stumbled upon some interesting information about spiral staircases in ancient and medieval architecture. I thought I would share a bit about the origin of the spiral stair in my next series of posts. From the skillfully engineered spirals of the ancient Greco-Roman empire, and stair designs used to thwart invaders in the castles of the medieval time period, to the more modern and imaginative spiral stairs of the 21st century. is believed to appear in Temple A in Selinunte, Sicily, to both sides of the cella, which was constructed around 480-470 BC. The common design of many ancient spiral staircase structures included a center newel, crafted out of stone, which the stone stair slabs where constructed around. It wasn’t until the completion of Trajan’s column in Rome. (113 AD.) when the new spiral stair design really became more common in Roman Architecture. Still standing in Rome today, Trajan’s column is said to be the oldest ‘preserved’ spiral stair structure in the world. Trajan’s column, including its base is built of marble standing at about 42m high (138ft). The outside of the column is wrapped with a band of reliefs depicting the victories of Trajan’s army in the Dacian wars. More than 2000 carvings spiral upward, the entire height of the column, depicting the war from army preparations to the very last Dacian expelled from their country. But, perhaps the most unique characteristic of Trajan's Column is the winding staircase that exists inside. The precision and workmanship displayed in this spiral stair is incredible. Also present are a series of windows strategically placed on the outside of the column to give light to someone walking up the stairs. At the top of the stairs was the viewing platform, which overlooked the Markets of Trajan, Trajan's Forum, Capitol Hill, and the Campus Martius. After completing the spiraling journey, the visitor would be viewing the splendor of Rome from over 120 feet in the air, which must have been simply breathtaking for the ancient Romans, even as it is for us today.